Rebound exercise or Rebounding is a type of elastically leveraged low-impact exercise usually performed on a device known as a rebounder—sometimes called a “mini-trampoline”—which is directly descended from regular sports or athletic trampolines. Some of the basic movements and actions of rebound exercise include bouncing in place (sometimes also called “jumping”), jumping jacks, twists, side-to-side motions, running in place, dance movements, and a wide variety of other movements, patterned or un-patterned, with or without the use of hand-weights or other accessories. A wide variety of physical and other benefits are claimed for rebound exercise, which experienced a tremendous upsurge of interest (often called a “fad”) in the mid-1980s. A rebound exercise program can focus on aerobics, strength, or just simple easy non-jarring movement, depending on the needs of the person bouncing. Typically round, rebounders are much smaller (at about 3 to 4 feet in total diameter) than regular trampolines, and they are not designed for stunts. 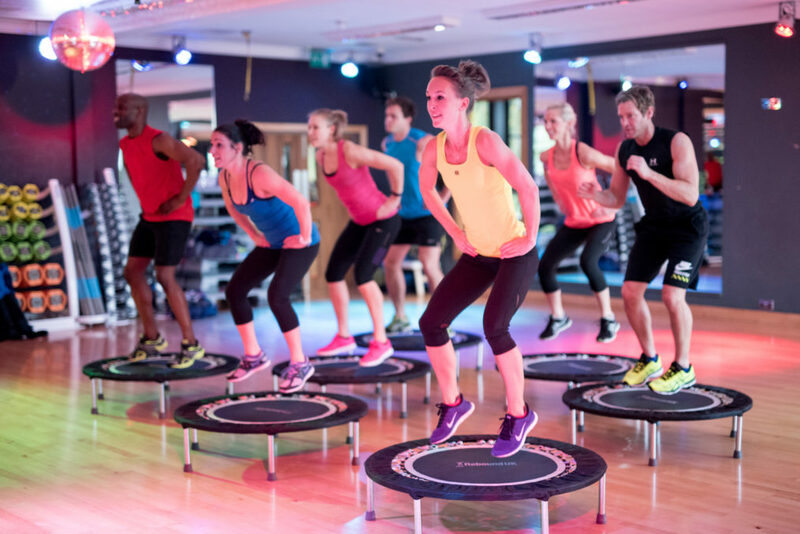 Other equipment for one or two feet, such as Kangoo Jumps or BOSU balls, can provide a type of rebound exercise experience, and regular, full-size, sports or athletic trampolines can also be used to perform the various movements, routines, programs, and styles that characterize rebound exercise. Rebounders are predominantly used solo in personal homes, but are also found in some health clubs, and physical rehabilitation centers. The modern trampoline was created by George Nissen in Grand Rapids, Iowa, in 1936. In 1938 the first “small trampoline” was created by Ed Russell, who left his ideas and prototype with Victor Green, who patented the “small trampoline” in 1975. Within a year, five American companies were manufacturing small trampolines, which were soon called rebounders. In 1977, Albert E. Carter published a pamphlet entitled “Rebound to Better Health.” Carter was a professional trampolinist who, with his family, had toured the United States performing “Gymnastic Fantastic,” a corporate-sponsored trampoline show. In 1979 Carter published The Miracles of Rebound Exercise where as “the father of rebound exercise” he put forward his ideas about the science and benefits of rebound exercise. He described his family members, including his son and daughter, as having tremendous strength and vigor because of their regular trampolining activities. In part because of Carter’s promotional efforts, and in part because of a number of scientific studies that seemed to support the value of rebounding (see “Scientific Studies” below), from 1981 to 1984 rebound exercise became very popular in the United States, with reportedly over one million units selling a year. The fad faded by the end of 1984, supposedly because poor quality foreign-made units had flooded the U.S. market. Today, there appears to be an upsurge of interest in rebound exercise, in part due to increasing quality of equipment and in part due to its use in physical therapy and the fight against obesity generally. Rebound exercise is especially popular in holistic health circles, as rebounding is said to combat a number of ailments (see “Claimed Benefits” below) given its ability to generally and gently stimulate the immune system and provide aerobic exercise without jarring the physical structures of the body as the elastic element of the rebounder is said to take up to 85% of the shock that the body would otherwise experience. Rebounders are often called “mini-trampolines,” but this is a misnomer. Trampolines are generally much larger, and are designed to perform stunts such as flips and seat drops, while it is dangerous to perform stunts on rebounders. While there are “double mini-trampolines” used in sports and even Olympic competition, these are designed specifically to perform stunts and are used in a substantially different manner than is the typical rebounder. 6 legs between 8 and 14” long. A durable mat with an elastic nature. An elastic element such as spring or bungee bands. A round elevated rim which the legs support and which is attached to the mat by the elastic element, either springs or bungee bands. Since their introduction, many improvements have been made to the quality and construction of rebounders. Spring size, shape, and durability have improved greatly over time, and in the last several years springs have been replaced entirely in certain high-end units by bungee-bands, which are quieter and may also offer certain advantages in terms of smoothness and user experience. Units with folding legs, and units whose entire body (including the mat and the rim) folds in half, or even in quarters, have been introduced. Rebounders can be purchased for anywhere from between $ 40 and $ 1,000 and up. Rebound exercise begins as soon as someone steps on a rebounder and begins to move their body. It can be highly aerobic — full-on sprints and interval training are ideal on a rebounder, because it does not jar the physical body anywhere near as much as does hard ground — or it can be very slow and gentle, with only a gentle rocking taking place. Just as rebounders have evolved from poorly made spring-based units to modern spring-based units and high-end bungee-based units, the types of exercise and movement done on rebounders has evolved as well. Al Carter initially introduced the distinction between the “health bounce” (a gentle rocking motion that anyone in any state of health can do, which was said to stimulate the immune system), an “aerobic bounce” that involved elevating the heart rate (either running in place or dancing), and the “strength bounce,” which involved higher bouncing with both feet leaving the mat (leading to both abdominal and lower body strength directly as well as to the strengthening of all bodily cells through the accelerative force applied (see Claimed Benefits below). Increased Lymph Flow & Immune System Function: Rebounding is said to lead to greatly increased lymph fluid circulation, leading directly to a boosted immune system, greater white blood cell activity, and increased detoxification generally; Cardiovascular and Respiratory Improvement: Rebounding is said to directly yield impressive aerobic exercise benefits in terms of heart strength and functioning, respiration, and related physiological functions; and Physical Strength, Muscular Development, Coordination, Balance, and Flexibility: Rebounding is often said to improve all of these. Low Impact, Less Strain on Joints, Soft Tissue, Skeleton: The elastic element of a rebounder, either springs or bungee bands, absorbs much of the impact or shock on each bounce, thereby making rebound exercise more attractive to those who need to avoid shocking or straining their joints, soft tissue, and skeleton. Rebounding is said to assist dozens of specific medical conditions—from arthritis to vision improvement—but there is little scientific evidence for these claims. ” averting the deconditioning that occurs during the immobilization of bed rest or space flight, due to a lack of gravireceptor stimulation (in addition to other factors), requires an acceleration profile that can be delivered at a relatively low metabolic cost….for equivalent metabolic cost, and acceleration profile from jumping on a trampoline will provide greater stimuli to gravireceptors.” A small number of other independent scientific studies have been done on rebounding, most from 1980 through 1983 at the peak of the rebounding fad. The easiest rebounding technique is known as the health bounce. This exercise is suitable for nearly everyone. To perform the health bounce, stand on the rebounder with your feet shoulder-width apart. Gently bounce up and down, but do not bounce hard enough that your feet leave the mat of the rebounder. Bouncing in this manner will get your blood flowing and your lymph moving. The health bounce is a good general exercise for those who cannot tolerate higher intensity workouts, and it’s also suitable for warm-up and cool-down. To increase your heart rate and enjoy the benefits of aerobic exercise, you can jog, do jumping jacks and even sprint on your rebounder. For additional cardiovascular benefits, add hand weights if you feel comfortable. Performing aerobic bounce to music will help prevent boredom and make your workout more fun. 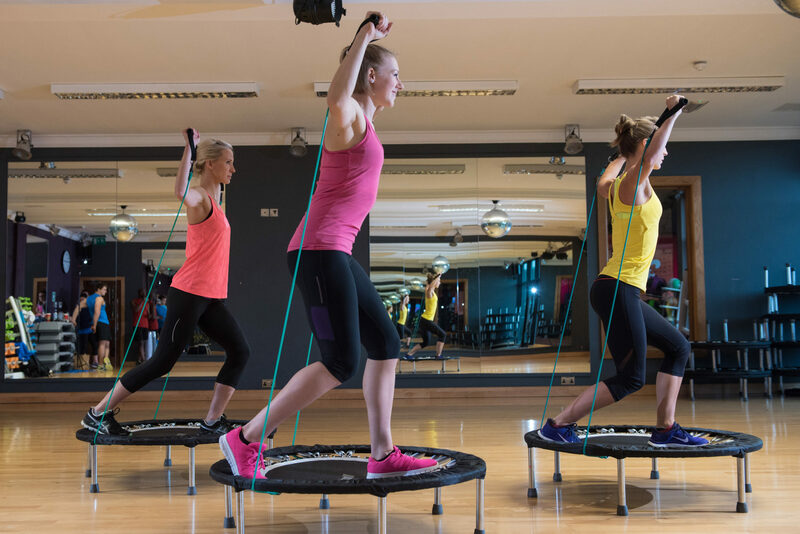 Aerobic exercise on the rebounder is particularly good for individuals with sensitive joints because it reduces the impact on the joints by 87 percent. The strength bounce is one of the most difficult techniques used in rebounding because it involves balance, coordination and stamina. To perform this bounce, simply bounce as high as you can on your rebounder. You should only perform the strength bounce for 10 minutes at a time to avoid overtiring your body, which can lead to injury, especially when flying high on a rebounder. To change up your rebounding exercise technique, alternate exercising on and off of the trampoline. If your balance and coordination are good, practice jumping on and off of the rebounder, one leg at a time, or both at the same time. The impact will be greater since you’re going back and forth to a hard surface, but it may help change it up if you get bored, and it can add an increased level of difficulty as well. Individuals who cannot stand can still enjoy the benefits of rebounding. These exercises have much less intensity, but can still be effective in getting the lymph moving. These individuals can sit in a chair beside the rebounder and simply bounce their legs on the trampoline. Alternatively, if the person can stand long enough to sit on the rebounder, she can sit and either bounce herself gently in a seated position, or a partner can bounce her gently. It is a good idea to do warm-up exercises before any workout. Warming up before bouncing will help increase your heart rate and blood flow to your muscles. Try some jumping jacks, jump rope or just march in place for about 10 minutes. Cool-down exercises will help remove the lactic acid in your muscle tissue that contributes to sore muscles. Cooling down will also help slow your heart rate. Stretching or walking for about 10 minutes are effective ways to cool-down your body and relax your muscles. Jog on a rebounder and hold two lightweight dumbbells to jazz up your jumping-jog workout. Stand on the middle of your rebounder with your feet slightly apart. Hold the dumbbells at chest level with your elbows bent and start bounce-jogging. Lift each knee as high as you can. The forward knee bounce is similar to jogging on your rebounder. Start by standing in the middle of your rebounder while holding the dumbbells at chest height. Bend your elbows and start gently bouncing. On the up bounce, bring your right knee straight up and simultaneously swing your arms down to your sides. Lift your arms up as you lower your right knee. Swing your arms back down and bring your left knee straight up. Sit in the middle of your rebounder and hold a dumbbell in each hand. Extend your arms out from your shoulder with your palms pointed down. Straighten your back by dropping your shoulders down and back about 1 inch. Squeeze your abdominal muscles tight and gently bounce up and down. Keep your bottom on the surface of the rebounder as you bob up and down. Do some abdominal crunches by sitting in the middle of the rebounder. Bend your knees and place your feet on the rebounder mat. Hold the dumbbells at chest level and lean back a few inches. Bounce up and down gently. Rebounding is a joyful way to exercise, but the rebounder is not a toy. Make sure to store your rebounder where the kids can’t get to it. Ensure the areas above, below and around your rebounder are clear of objects, such as toys, shoes, books, anything sharp and also light fixtures above your head. Exercise gently and for a short period of time, about five minutes, the first time you try your rebounder and dumbbells. Always check the surface, springs and frame of your rebounder for damage before you bounce. Rebounders are inexpensive. It’s safer to replace a worn or damaged rebounder than to risk injury. Rebounding is a low-impact way to get in shape. Hold some light-weight dumbbells in your hands while you bounce to make your rebounder workout even more effective. Researchers at the Human Performance Lab, University of Alabama in Tuscaloosa found that holding dumbbells during rebounding can increase the intensity of your workout. Hold a 2- to 5-lb. dumbbell in each hand to boost the benefits of a rebounder workout. The workout is tough — rebounding pushes your muscles to fatigue — but has a lower risk of injury. Bouncing also increases both your blood flow and lymphatic-fluid circulation, which is good for active muscles too.